An old church site has caused a big stir in Lambton County and raised ethical questions about burial grounds and monuments. This blog post will provide a brief outline of the controversy and then summarize some of the documents in our collection at the Lambton County Archives that point to the existence of a pioneer cemetery. At the beginning of October a small woodlot at 8947 Petrolia Line was cleared by a bulldozer. 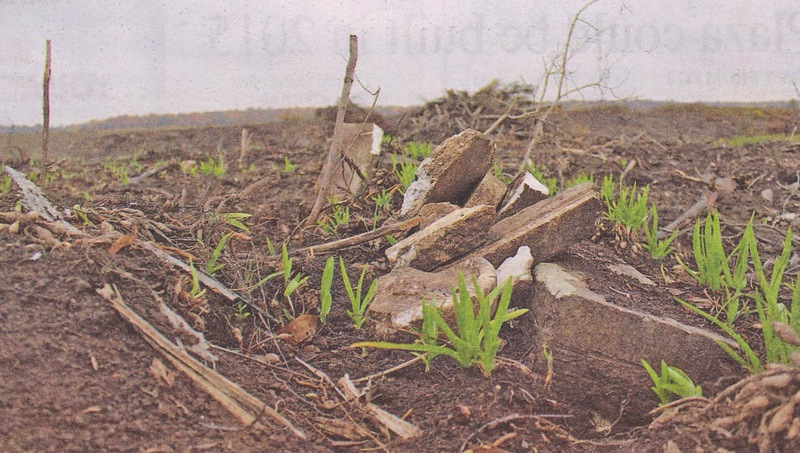 When a citizen noticed broken monuments on the bulldozed site, the individual posted a notice on the internet expressing concern that a pioneer burial site was being disturbed. This post resulted in a flurry of activity on social media (see posts on the Lost Lambton, Found! Facebook page) and a backlash from local residents. One group erected a sign and a roadside memorial commemorating the Victoria Methodist Episcopal Church that once stood on the site. published in The Independent, Oct. 23, 2014 p. 1. The Cemeteries Regulation Unit of the Ministry of Government and Consumer Affairs was contacted. Spokesman Stephen Puddister was quoted in The Independent urging caution about the site: "The presence of broken and discarded monuments does not necessarily mean there are burials under the monuments. It is not unusual to find old, discarded monuments throughout Ontario." Many local residents remain concerned about how this site has been treated. What can we learn from the records at the Lambton County Archives about this mysterious burial ground? According to our land records, Bennajah Doan granted the Trustees of the Methodist Episcopal Church a small portion of land on Lot 28, Concession 10 on June 14, 1965. The small church folded in approximately 1892. The Brooke Township Women's Institute Tweedsmuir History has the following reference: "Keith Houston has the cemetery fenced in and has never ploughed it. It is on his property. Most of the headstones were removed. There are only about 1½ left there." Some accounts from local historians have also supported the presence of a cemetery. Helen Clark of Chatham grew up in the area and remembers talking about the site with other local residents: "A number of years ago I also talked with a person … She found only a partial stone amongst the overgrowth, with a portion of a name - 'Peter McDerm....' During the past 2 years I have been compiling a community history on many of the early pioneer families and have done further research on the McDermid family. I really feel that Peter McDermid was buried there, but have no documentation to support that conclusion." We can confirm from the OGS cemetery transcriptions that at least two bodies were moved from "Victoria Church cemetery" and interned in Alvinston Cemetery. These were the bodies of Thomas Styles (d. May 18, 1888) and Sarah Styles (d. May 19, 1886). One of the key questions in this debate should be: if some bodies have been removed, are there other bodies that remain buried at this site or have all the bodies been removed? Keep an eye on the news to see if more developments are published as this story continues to unfold. Brooke Township Land Abstract Book B p. 292. The landowner is also referred to as "Benjamin." Sara L. Campbell, Brooke Township History: 1833 - 1933 p. 113. Brooke Township Women's Institute Tweedsmuir History, "From the United Church Archives, Toronto, ON." Supplied by Catherine Watson. OGS Cemetery Transcription, "Alvinston and St. Matthew's Roman Catholic" p. 58.
is there any follow up to this story? We have not heard any follow up here at the Lambton County Archives. If we do, we will post a comment here!